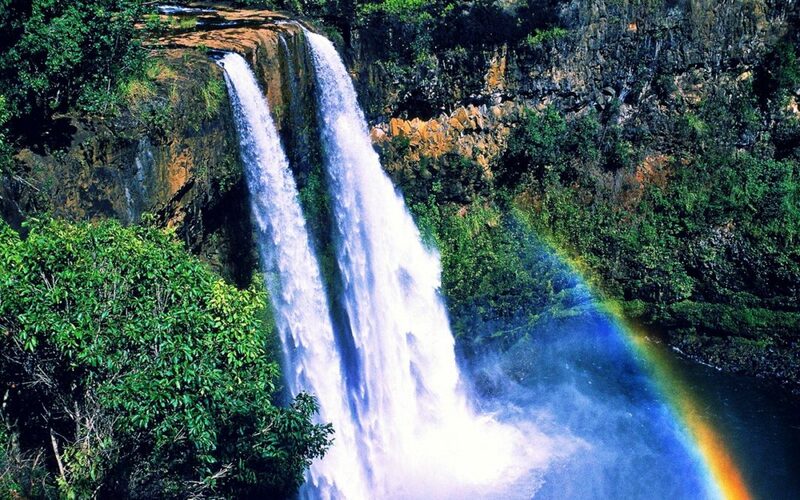 Whether you’ve got a few hours or several days to explore Hawaii Island (also known as the Big Island, for reasons that will become obvious as you drive the l-o-n-g distances between attractions), here are some of the must-dos on the island. Enjoy! There are currently two (count ’em, 2!) eruptions occuring within Hawaii Volcanoes National Park: at the summit and at the Puʻu ʻŌʻō vent on Kīlauea volcano’s East Rift Zone. However, even if you don’t get to see lava flowing, the park has many fascinating sights. 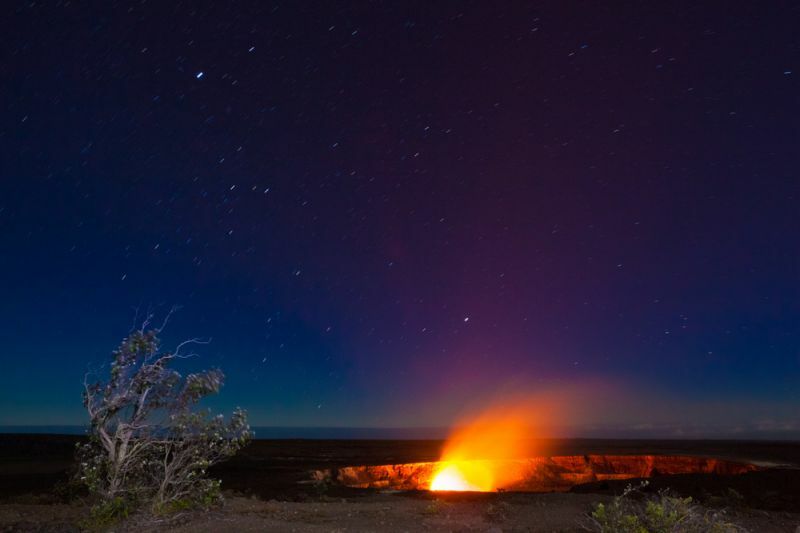 Hike the Kīlauea Iki trail, drive the Chain of Craters Road, walk through a lava tube and visit the Jaggar Museum. Learn more at the NPS website. If you’ve rented a 4×4 vehicle, check to make sure that your rental contract allows you to drive to the summit of Mauna Kea. Otherwise, you can join a summit and stargazing tour offered by one of many operators. 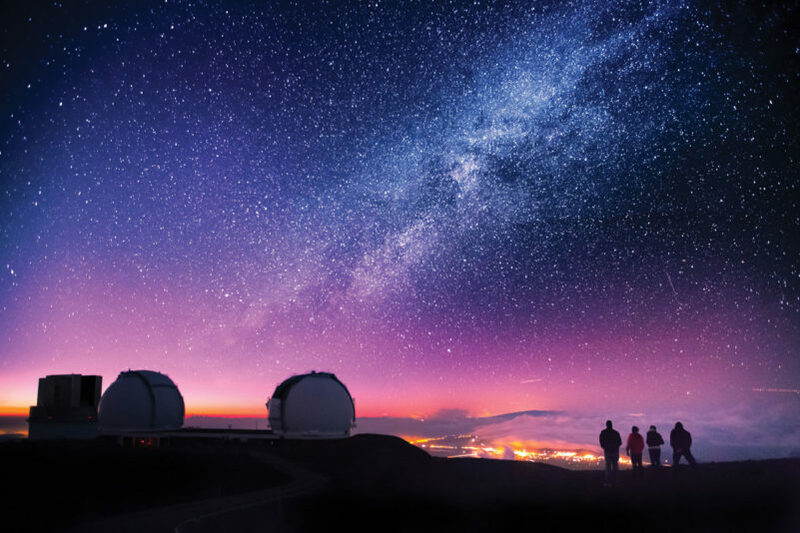 The Mauna Kea Visitor Center, located about halfway between Saddle Road and the summit before the end of the paved road, offers free stargazing four nights a week. Get details at the Visitor Center website. Technically, it’s more of a manta ray float (because you’ll be holding onto a float with bright lights underneath), but this is one of the very few places on Earth where you can be within inches of these beautiful, placid creatures – and the only place where you can have this experience at night! The three locations where you can see the manta rays on Hawaii Island are so-called “feeding stations”. The manta rays first started coming to these places to eat the plankton that was attracted by bright lights that shone on the water either from hotels or from divers. The manta rays feed on the plankton attracted by these lights and filter it out of the ocean by swooping through the water with their mouths open. While feeding the manta rays swim, turn, and somersault gracefully in the light beams. 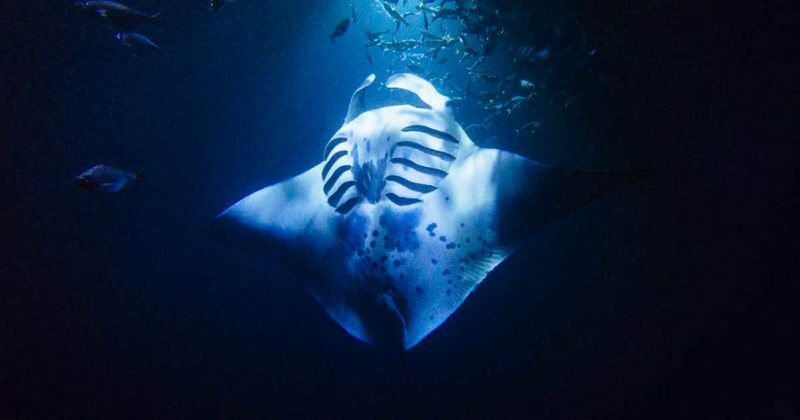 It’s been called a dinner show – the mantas get dinner and you get a show! 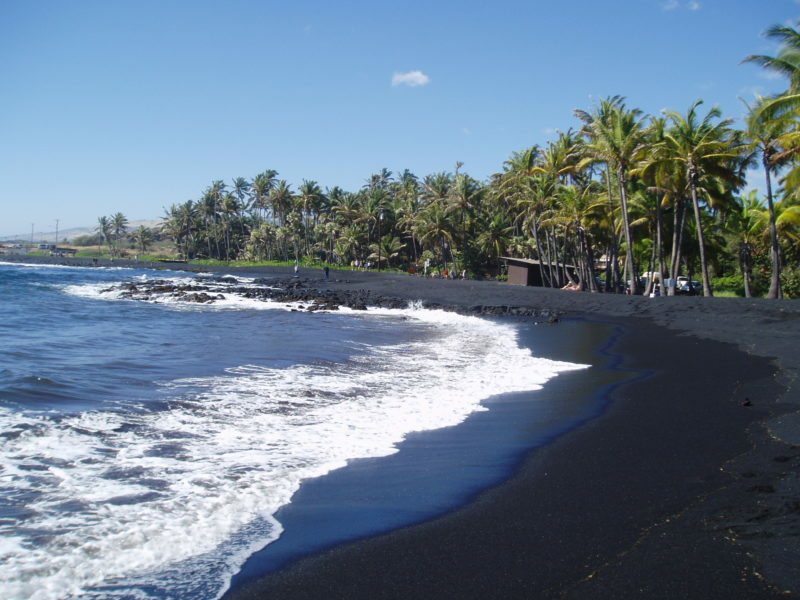 Punalu’u Black Sand Beach is the most famous black sand beach of Hawaii and is also known as ‘Black Sand Beach’. Besides the obvious black sands, another reason for the popularity of this beach is that you can often see endangered Hawksbill turtles and green turtles basking in the sun on the beach. Green Sand Beach is officially known as Papakōlea. 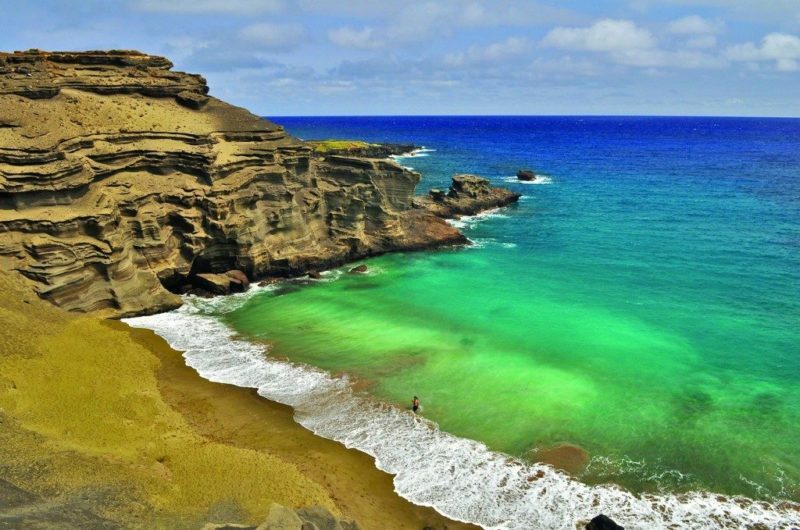 The beach itself is carved in a 49,000 year-old cinder cone belonging to the Mauna Loa volcano that contains the green crystals (olivines) that give the beach its name. The main attraction of this beach, of course, is the crystal green sand. Note that the green crystals that give the beach its name are mixed with black (lava) and white (coral) sand, and that thus some patches of sand are more green than others. Take the time to pick up some sand to inspect it closely. It’s positively breathtaking! 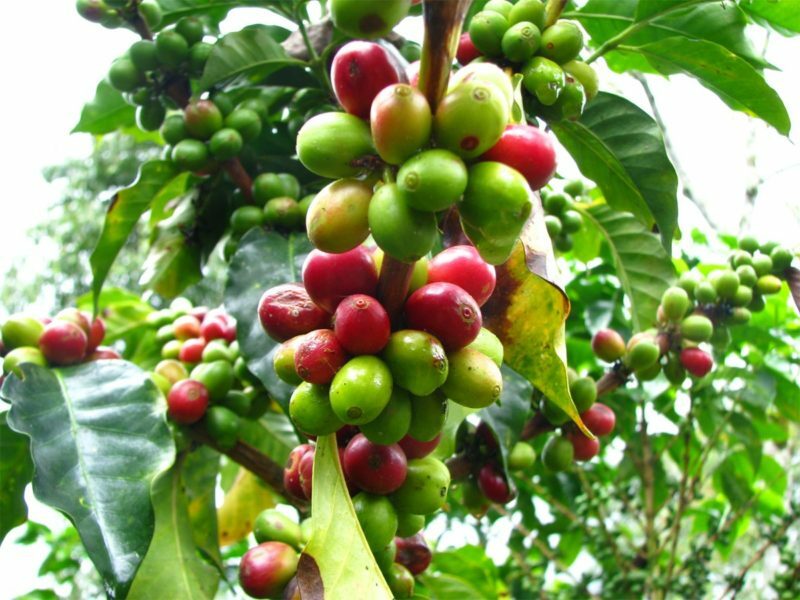 Visiting one (or a couple of) coffee farms during the day to learn about Kona coffee, to buy some coffee and, of course, to taste the coffee, is a great way to spend your day! All of the Kona coffee farms are located within about a 20-mile stretch of scenic country roads. Add to that the presence of a few shops, cafes, and a colorfully-painted church, and you have the perfect excuse for a self-drive coffee tour. Plan about one hour for your visit to each coffee farm, and make sure to check ahead of time whether you need to schedule a tour at your farm of choice.